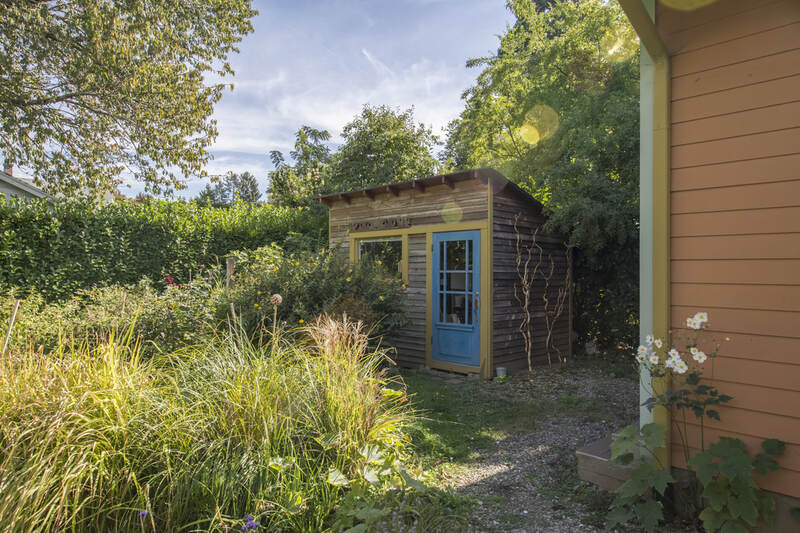 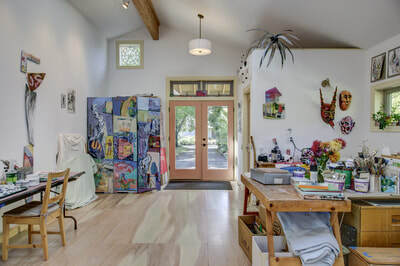 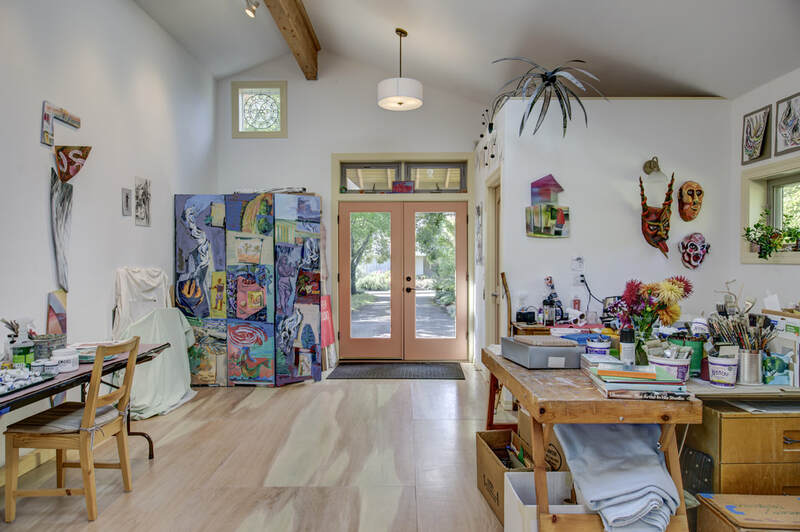 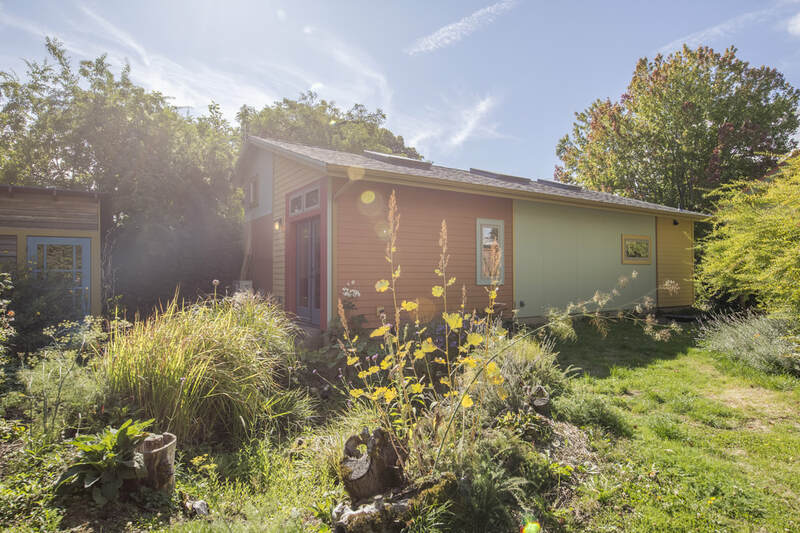 This 700 square foot art studio replaces the residence’s demo-ed garage, creating a custom space for SitePainters artists Laura Bender & John Early. 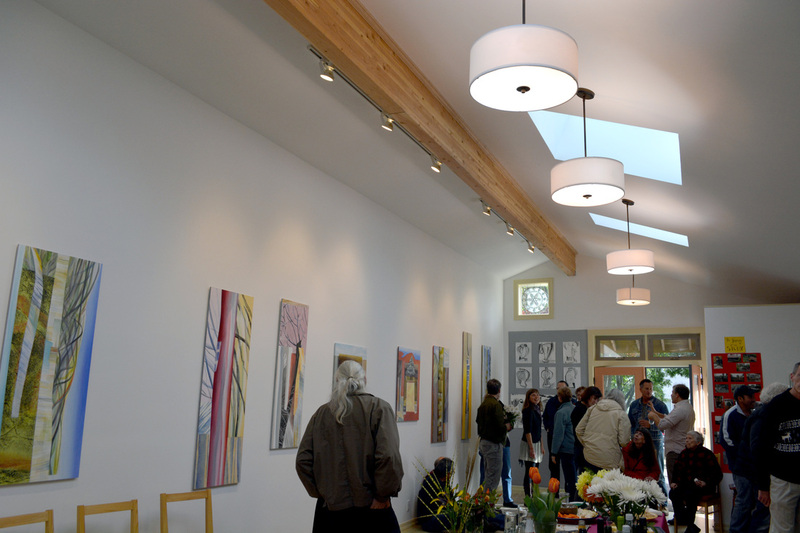 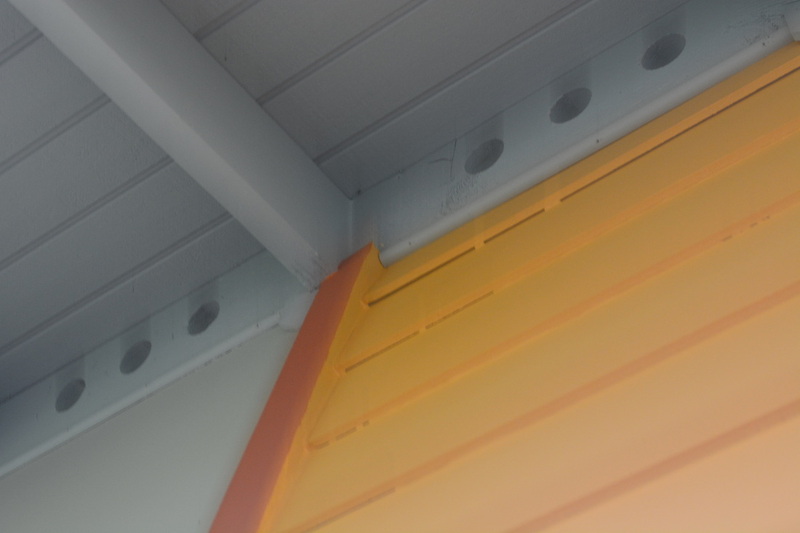 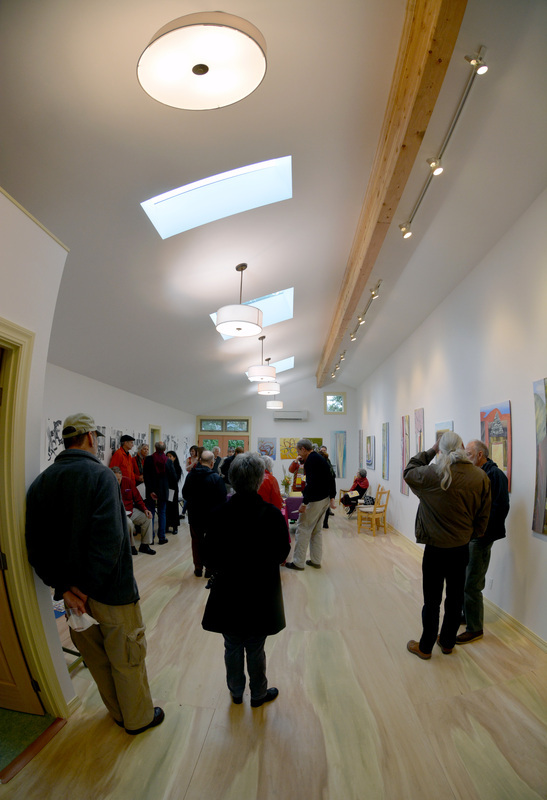 A saltbox roof line enables a taller, 12-foot-high wall along the non-windowed property line, ideal for staging larger art installations, and an interior layer of plywood detailed behind the interior sheetrock maximizes flexibility for hanging artwork here. The southern roof slope is designed for a future solar array, while skylights on the north slope permit diffused natural light to illuminate this vaulted-ceiling art space. 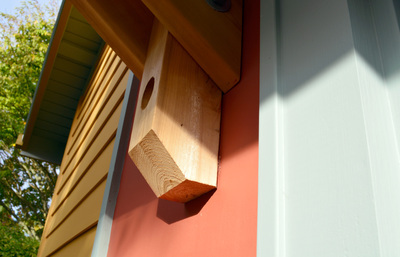 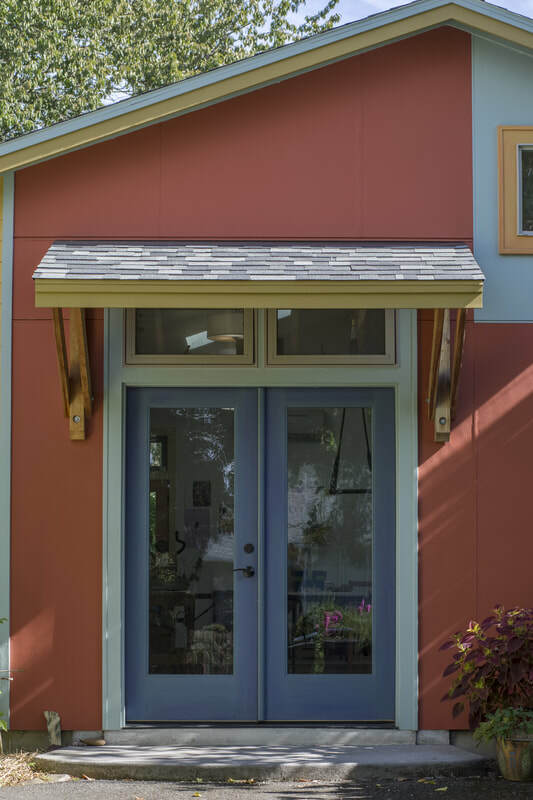 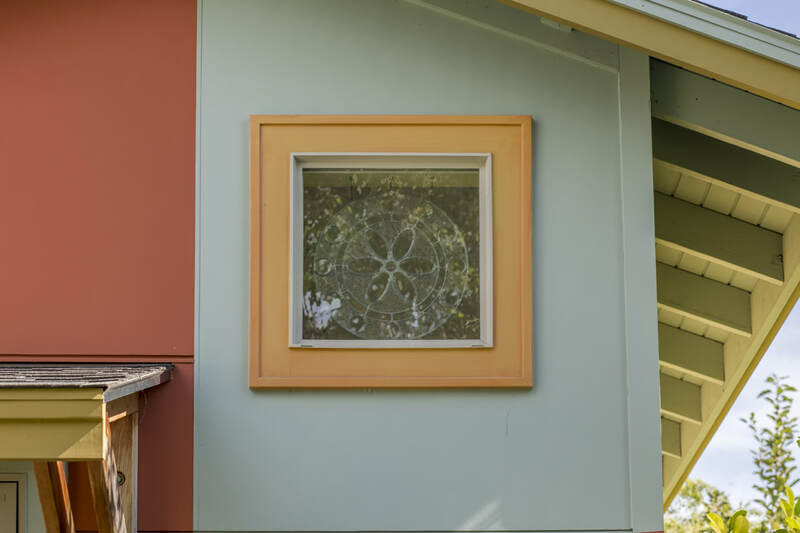 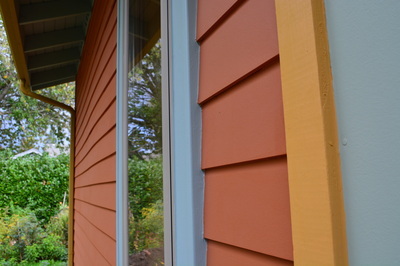 Built on a budget using cementitious siding, this simple yet durable siding hardly prohibits the studio's character from coming out through a playful pattern of geometry and textures. 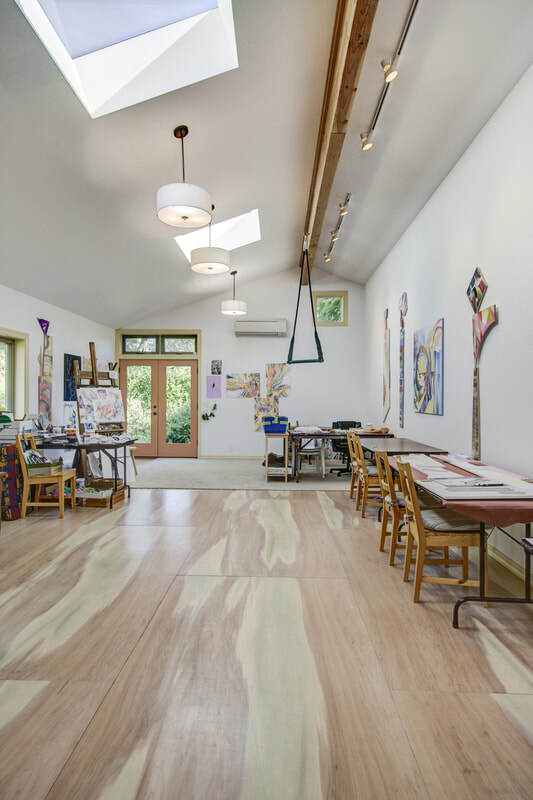 The plywood floor received a poplar veneer as an economic solution for a practical working surface. 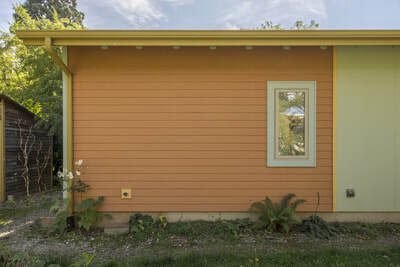 The new building replaced an existing garage, and salvaged lumber from the garage deconstruction was reused to build a new tool shed adjacent to the studio. 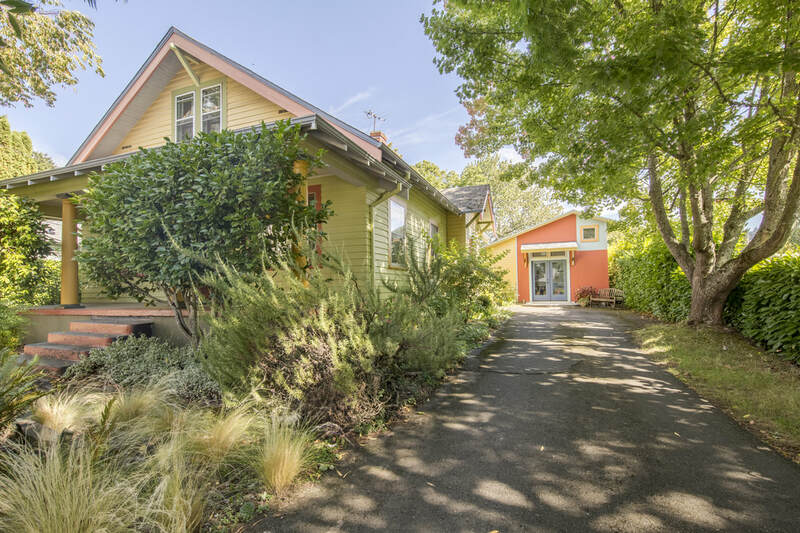 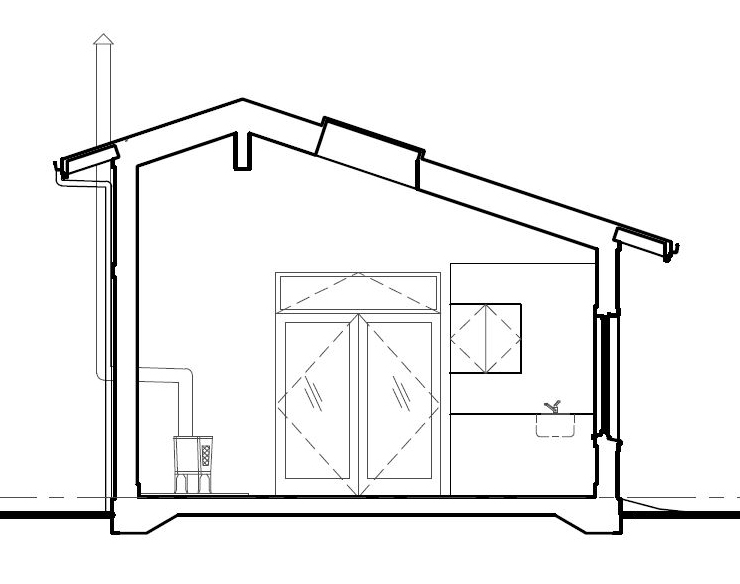 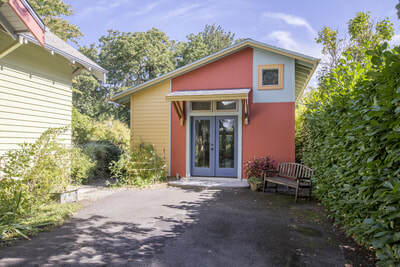 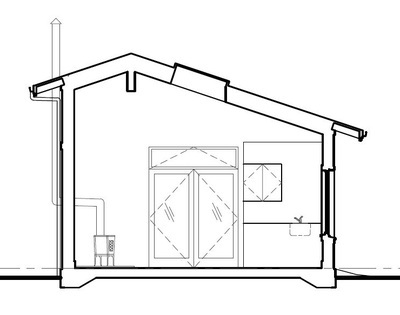 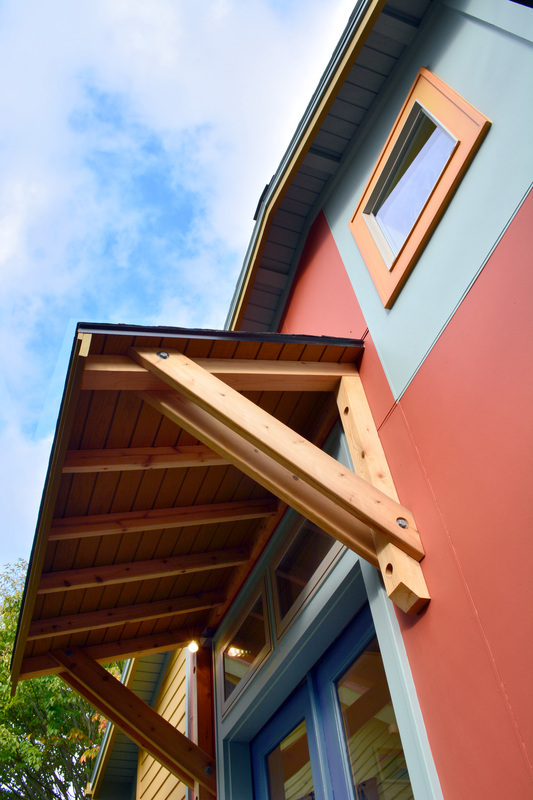 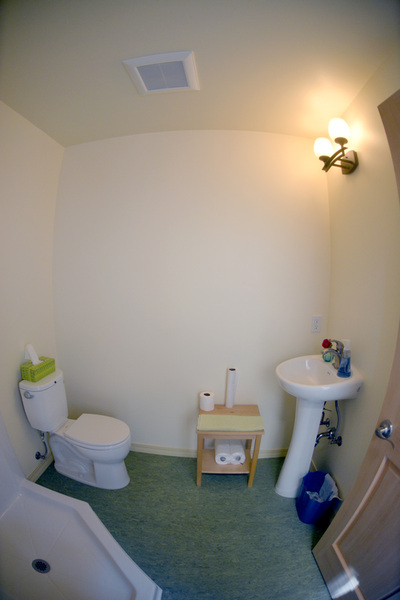 Property value is increased by designing and siting the art studio so that it can easily be converted into an Accessory Dwelling Unit (ADU) at a future date if desired. 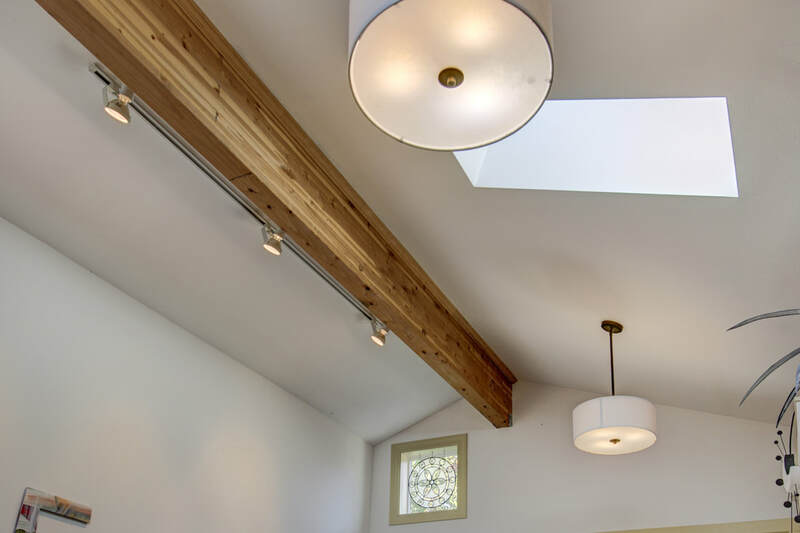 Collaboration with contractor & master craftsman Majo Ahrens Construction was contributed to an elegant project, leaving the clients thrilled at Majo’s skills, service, and adaptability for budget adjustments.